"I'm not a someone, I'm a something. I don't think the same way you do." 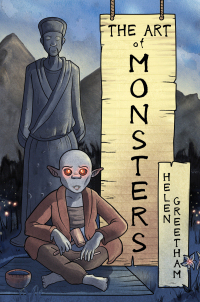 The Art of Monsters is a now complete short fantasy webcomic by Creator/Jabbage about why you shouldn't teach sculpture to supernatural beings. Set in a fantasy Tang Dynasty China, an ex-maneating monster called Hui has been whisked away from her lonely mountain home to explain a terrible crime she has just commited to the Celestial Bureaucracy. 40 pages later, and you're telling everyone around you that your allergies are playing up and that you've just got something in your eye. Bittersweet Ending: Hui and Wu Huan are dead, but Wu Huan gets a nice job in the afterlife, with a big, fancy hat. Hui is then reborn as a human. Incurable Cough of Death: Wu Huan seems to have been afflicted with this his whole life. Minimalist Cast: There are only three characters for 90% of the comic. Pygmalion Plot: ...in more ways than one. Taken for Granite: Wu Huans eventual fate. Vegetarian Carnivore: Hui is an ex vicious man-eating monster who is trying to survive on a vegetarian diet, but not coping very well.